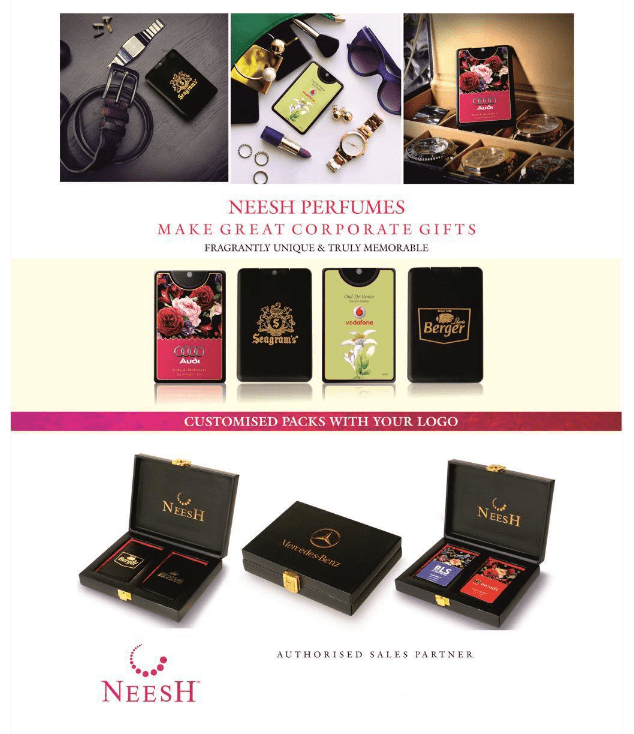 Neesh Pocket Perfume: New Novelty Corporate Gifts for Festivals of 2016 (3)! In the series of festival gifts for the calendar year 2016 the third product is very personal and will last for more than a year. The patented design is a unisex pocket perfume which will last on the body from 8 to 12 hours. Moreover, one pack will give 400 sprays which means it will last till the next festival arrives during the year 2017. The product is available on the retail shelves and modern trade and is being bought by end users at full MRP of Rs.340/-. The retail pack can be customised with your logo either as the label or gold foiled sticker as per the images given below. 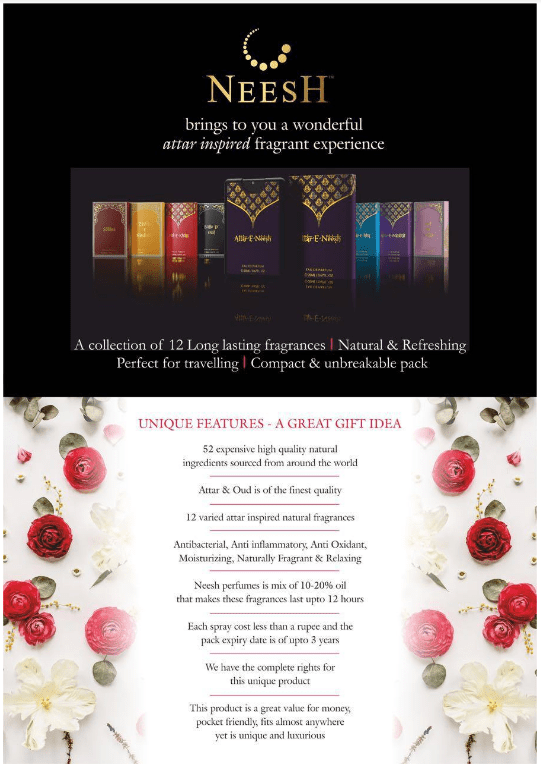 Please go through the brochure below to understand the unique features of the fragrant experience. The product has created good noise in the corporate gifting market due to personalized nature and handy utility of carrying the same in the pocket or ladies handbag. The cardboard box can be customized too with various logo branding options as per the various images shown below. Customized floral designs on the labels at the front and the back, logo on the outer carton box, gold foil stickers including personalized name on the container are few of the branding options with the product to remind consumers about your association for more than a year till next festival season arrives. The product can be given as business gifts to consumers, employees, partners, business associates, even friends and relatives as it will be appreciated by one and all. Field teams working the whole day out on the field under the sun will really appreciate the freshness and nice smell in spite of sweating due to extra-long lasting fragrances. Since the manufacturers are very strong with the research and development they can design your own customized fragrance if the quantities are very large. Keeping the various public taste in mind the product is available in mild, medium and strong notes in the retail market where the buyer can try and taste it before buying it. However, to take care of the mixed recipients of the business gift recipients we are providing 3 light fragrances in the gifting segment to make the experience of all users pleasantly surprised. 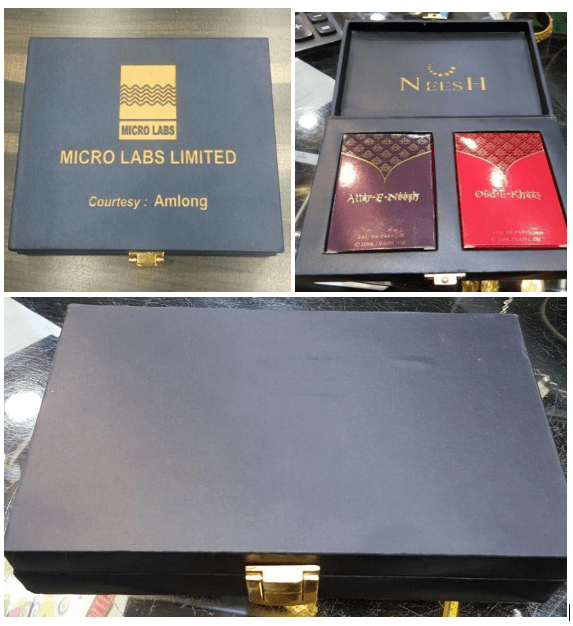 The luxury segment like cars, jewellers, builders are using the customised designer box of pack of two to gift it to their premium customers. The wooden box can be laser engraved with the logo to keep reminding the users about you and your long association with them. Pharma companies are giving it to the doctors and infrastructure companies to the architects to build relationship to be close to their influencers and well-wishers. Please check the various images to select the most appropriate design and box for your target audience. This gift ensures that the Audi, BMW and Merc owners are using your gift and not passing on to their drivers. We can assure you that this patented design with long lasting fragrance will be loved and appreciated by one and all. Please do get in touch with us for more details on the pocket perfumes! ← X-MEN Grooming Kits & Joy Skin Fruits Facial Packs: New Corporate Gifts for Festival 2016 (2)!